This Bartlett vacation home features soothing mountain views from all room and its expansive deck. Granite counter tops, new Samsung refrigerator, KitchenAid appliances, new oversized Azek Vintage deck with picturesque mountain views and a charming front covered porch are only some of the wonderful amenities of this home. With 2,500 sq. ft., two beautiful living rooms, four large bedrooms and four bathrooms, it’s a perfect floorplan for a family getaway. There's a private neighborhood white-sand beach on the Saco River. StoryLand and Attitash are both a five minute drive. There are many fantastic restaurants just moments away. The cozy fireplace and spectacular views will be waiting for you when you get back. Five of New Hampshire’s best ski areas are so close you’ll want to ski them all: Attitash is just over two miles up the street, Cranmore and Black Mt are only 12 minutes away, Bretton Woods 28 minutes, and the local favorite, Wildcat, is a short 20 minute drive. We love travelling, and spending time in the mountains. Our favorite activities are skiing, hiking, biking, fine dining and enjoying the company of family and friends. We were married in North Conway and dreamed of owning a vacation home in Bartlett that we could enjoy with our family and friends. 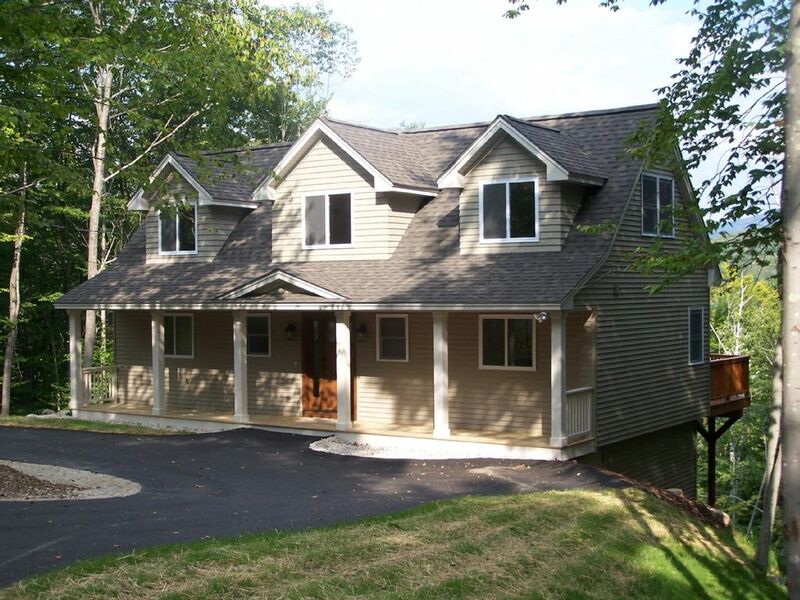 We're thrilled to own this beautiful home built by our friends Kip and Karen LaChapelle who've designed and built several homes in the Valley and the NH Seacoast. We've traveled all over the world and this is our favorite place to rest and relax. The stress of daily life melts away instantly as you pass through the front door and take in the expansive mountain views. New leather couches and a freshly replanked Azek Vintage deck beckon. The house is set up perfectly for two families or a multi-generational escape. Two-thirds of our guests each year are returnees. You won't be hounded to write reviews. Just having you come back again is enough for us. All of the bathrooms have granite counter tops. The oversized Tub shower unit in the Master suite is a huge six foot long tub that is three feet wide. The upstairs bathroom has a beautiful neo-angle shower unit with glass enclosure. Landline in kitchen and two bedrooms. Excellent cell coverage throughout the house, too. Two new 10,000 BTU GE air conditioners installed in July 2018. Several fans available, too. Forced hot-water, baseboard heat with four zones, each with thermostat. Linens Provided - Bed sheets, pillows and pillow cases, bath and kitchen towels are provided. Gas fireplace. Flip the switch and enjoy. U-shaped driveway has room for 4 or 5 vehicles. WiFi throughout the house with a booster for better coverage. Wired access via Ethernet at desk in upstairs bedroom. Plenty of towels for all. WiFi throughout the house with a booster for better coverage. Two living rooms. One on main level with cathedral ceiling, floor to ceiling windows with fantastic view and gas fireplace. Downstairs living room with Sony 4K Ultra-HD television and sound bar. Brand New Samsung Stainless Steel Refrigerator with Ice Maker. KitchenAid Stainless Steel with ceramic cooktop. KitchenAid Stainless Steel (4 slice). Two full sets of dishware and utensils. Fully Equipped Samsung and KitchenAid Appliances And Granite Counter Tops. Kitchen Open To The Living Room Area And Fireplace. Large dining room table with 8 chairs plus a child's chair. Three stools at kitchen island. Two tables on the deck: one seats six, the other seats two to four. 50" Samsung 4K Ultra HD on lower level. 36" Samsung HD on main level; wall-mounted units in master bedroom. Samsung 4K Ultra HD on lower level. 42" plasma HD on main level; wall-mounted units in 3 bedrooms. TimeWarner Cable with wide selection of channels. Two DVD players. One in each of the two living rooms. Collection of hiking, rock climbing, backcountry skiing, and local history books in upstairs bedroom. Lots of games and puzzles in living room closets (upstairs and downstairs). Almost 60 DVDs for Children And Adults. Wooded lot. Small side yard. Extra large deck with spectacular views, two outdoor tables, seating for 8. If you have special requests we will do our best to help make your stay as perfect as possible. Please remember that this is a No Smoking Property and we are sorry but we do not accept pets. Trash removal is the responsibility of the tenant. A map and directions to the transfer station will be provided. It is a great house and location. We rented this house for about 6 years it works very nice for large groups. We have been renting this home for the Martin Luther King, Jr. holiday weekend in January for most of the last decade. A very comfortable place with all the modern conveniences (that are sensible!). The owners provided us with updated information on the weather when a snowstorm was scheduled and outlined the snow tools available and their person to plow the parking area in front of the house.. This our sixth year renting this home— we love it! Beautiful home in pristine condition! Comfortable, great location! Amazing views in this super clean and spacious home! Spent the weekend here during 2018 holiday season with two families(8 people). The home has 3 levels for everyone to spread out and some great areas with lots of couches for congregating. The home is very modern and has spectacular views. There was nothing that we felt we were missing. Location wise, it is 5 minutes from Attitash, 25 minutes from Bretton Woods, and 10 minutes from downtown North Conway. Fantastic place! We stayed here for our annual Thanksgiving family getaway and absolutely loved it! There was plenty of space to spread out, relax and get warm after driving up in an unexpected snow storm! The plus side to that was having the snow make the already great view extra beautiful and the house itself is gorgeous! The kitchen/dining room area was well laid out with a large kitchen island which allowed us to enjoy our Thanksgiving feast buffet style. The beds were very comfy which is something that can be hit or miss when renting. The hosts were very accommodating and answered any questions that we had. This is one of the best places that we have rented and we would definitely recommend this property to anyone who wants a comfortable stay with great views in a quiet neighborhood. Thank you so much for your kind words, Jayne. We're very happy that you and your family enjoyed Thanksgiving at our mountain house. We hope that you'll come again! Very comfortable for 4 couples - great kitchen/dining/open living room layout. The view of the mountains is spectacular and the outside deck lets you enjoy it even more. Well-stocked kitchen had everything we needed for cooking and serving. Recommend you hike the nearby trail up Mt. Stanton (good second day hike). Owners were super nice. Thank you so much, Gretchen. We're thrilled that you enjoyed our mountain house for your milestone celebration. We love that Mt Stanton hike, too. There are tons of wild blueberries up top in July and August. Hope to have you back again! Staying with us in Bartlett brings you to the center of all the White Mountains have to offer. You can walk to the trailhead of Mt. Stanton and Mt. Pickering right from the house. It's a great moderate hike with breathtaking views. We are also surrounded by great hiking, swimming, skiing, snow tubing, mountain biking and rock climbing if you're adventurous. If you're more of a shopper, then you're in luck - North Conway Outlets are about a 10 minute drive. We also have great antiquing, summer concerts, live theater, foliage, fall festivals, along with more restaurants than you could ever visit in a lifetime. You may even see a black bear or moose while you’re here. The valley is a great place to visit any time of year and we would love to help you enjoy your visit here. Book your vacation today and start enjoying the beauty of the White Mountains of New Hampshire. Summer Weeks (July, Aug) are Sat - Sat stays only.